It looks like Foundation Fighting Blindness (FFB) has a new blog, Eye On the Cure with posts from Dr. Stephen Rose, Foundation Fighting Blindess’s chief research officer. Steve will post perspectives on retinal research and other related news as well as posts from the road as he travels on research trips as well as covering vision related meetings like our upcoming ARVO and the RD meetings in Germany which should be interesting to follow. 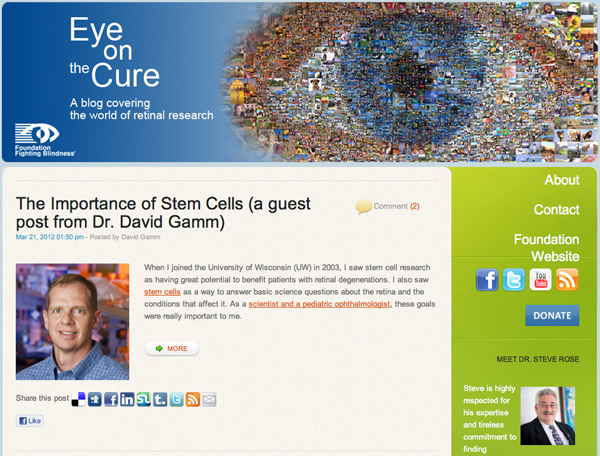 I’ve added the blog to my RSS feed and look forward to seeing what Steve has to say. As an aside, it looks like FFB have adopted WordPress which is good to see and have also implemented speech and options for easier access for screen readers which is also good to see. Its also refreshing to see private foundations dedicated to providing resources to funding get with the times so to speak and start using modern technologies to communicate their mission to the wider world.